The death of Sergeant Philip Hewali has amplified the need for more police officers to be brought into Hela Province. 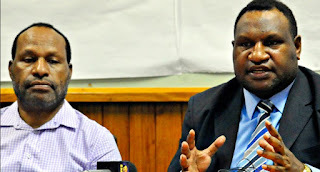 Tari Pori MP James Marape said that the number of officers in Hela has now dropped to 25 after the shooting of Sergeant Hewali. “On Christmas I was received by a police parade in Tari and saw that the whole of the 350,000 people in Hela is being served by only 26 general duty police personnel. “We are now left with 25 on strength, I now call upon the Police Commissioner Gari Baki to increase Hela’s police presence to more than 500 police personnel and this death amplifies that need,” Mr Marape said. “Our district and provincial government is ready to build more houses for police and the Correctional Services, he said. Meanwhile, Provincial Administrator William Bando has supported the call by Mr Marape. Mr Bando also said that the provincial administration was doing its best to address the overall law and order issues in the province. “We have been asking for the approval of our provincial police structure and the request for the soldiers to assist the policing issues. “Yet we are waiting and still waiting and our police officers are being killed,”Mr Bando added.